Remember when Avatar was supposed to revolutionize cinema beyond just perpetual added 3D glasses charges? James Cameron’s box-office phenomenon, hailed for its photo-real environments and digital characters, may not have been a storytelling bonanza, but it did establish exciting possibilities for the future of special effects pictures. So what happened? Aside from the anomalies that were Gravity and Life of Pi, audiences were mostly gifted with synthetic fodder like John Carter, Jupiter Ascending and The Hobbit trilogy, along with a glut of blockbusters boasting phony green-screen universes. And what seemed so special and promising in 2009, has lately been largely replaced in studio marketing materials with breathless hype for the in-camera practical methods of superstar talents like J.J. Abrams, George Miller and Christopher Nolan. CG technology is capable of birthing wondrous spectacle. Alas, all too often it only leads to wondrous eyesores. 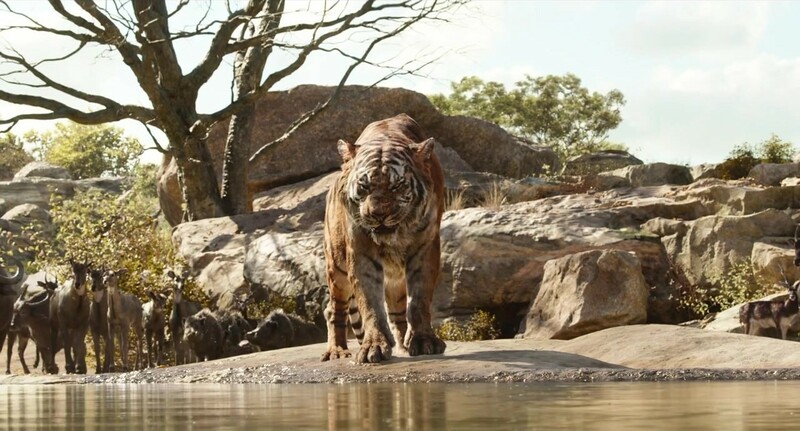 This is why Jon Favreau’s visually sumptuous and boundary-pushing The Jungle Book is such a refreshing surprise. Sidestepping the deadly pitfalls that have doomed so many recent would-be fantasy epics, this high-tech take on Rudyard Kipling’s beloved late 19th century story collection is an absolute celebration of astonishing sights and sounds, topped off with a few scares, some laughs and plenty of heart. Kids will love it, while adults may be more than a little startled to find themselves just as invested in the magical proceedings. Take note all filmmakers aspiring to translate animated hits to live-action: this is how you do it. The bar has been set. No doubt you could all recite the story on autopilot. 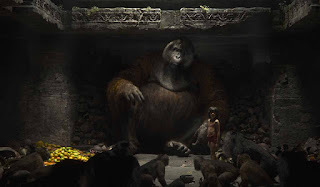 It, of course, involves Mowgli (plucky newcomer Neel Sethi), a young orphan raised by wolves, who must make a perilous journey to the Man Village after drawing the murderous attention of the fearsome tiger Shere Khan (Idris Elba). Actively rallying against this forced relocation, the boy struggles stubbornly against the stern guidance of his mentor, the wise panther Bagheera (Ben Kinsgley), before being separated and left to fend for himself in the dark and dangerous wilderness. 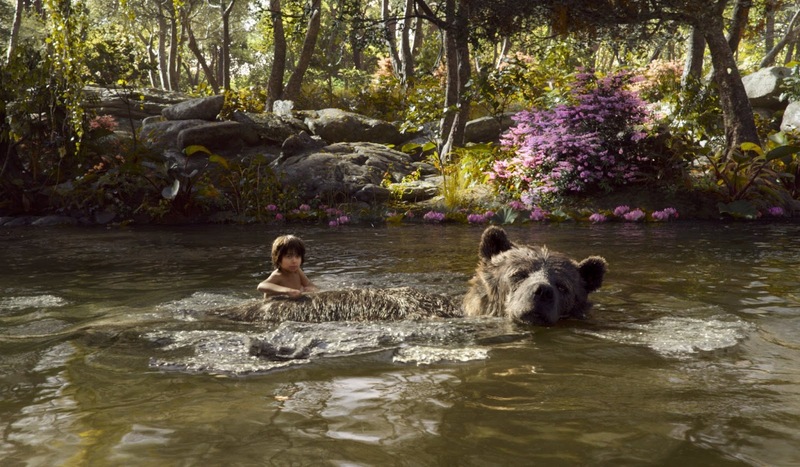 It’s during this period he meets Baloo the bear (Bill Murray), a carefree and somewhat opportunistic honey glutton, who offers a free-spirited alternative to a life of civilization. Cue the song. As many will recall, Disney has made two major valiant efforts to tame this renowned material before. The company’s 1967 animated version – the last hand-drawn masterpiece that ol’ Uncle Walt had a significant hand in producing – is an undisputed classic, filled with wonderful songs (three of which are included here, a little too discreetly), iconic characters and some genuinely intriguing era-specific allusions regarding Mowgli’s struggle to decide between a ‘normal’ human existence and Baloo's very 60s counter-culture lifestyle choice. It’s a fantastic picture, and likely the most subtextually rich adaptation we’re likely to get. When the company made the move to live-action for the first time in 1994, with Rudyard Kipling’s The Jungle Book, directed by The Mummy helmer Stephen Sommers, much of the innocence and quirkiness was stripped away. In its place audiences were presented with a more mature and straight-forward Tarzan narrative and plenty of wonderfully grotesque Indiana Jones-esque adventure sequences. Not a great effort by any means, yet still a diverting and occasionally thrilling one. All of this is to say that Favreau, a director rarely recognized for his aesthetic daring and reliability, had a mighty big hill to climb with this third Disney take. But climb it he does! Teaming with Avatar’s brilliant effects supervisor Robert Legato, the director utilizes the same lightness of touch, character insight and talent for staging interesting action that made his work on the first two Iron Man entries so memorable. Shot entirely in a Los Angeles warehouse (! ), The Jungle Book is an utterly convincing miracle of unpretentious state-of-the-art movie-making, delivering frame after frame of absolutely gorgeous and evocative imagery, as well as kinetic set-pieces that vibrate with awe and suspense. It’s rare nowadays to recommend seeing a motion picture in 3D (Good God, is it ever…). This one bucks the trend, though, and demands to be seen as it was intended in the best theatre possible. An iPad viewing won’t be a tenth as exhilarating. If there is a bone to be picked with The Jungle Book it’s one that also plagued the 1967 version, which is a noticeably episodic narrative. Screenwriter Justin Marks – who’s only noteworthy produced project is 2009’s infamous Street Fighter: The Legend of Chun-Li – does what he can to smooth out the story, and succeeds a fair deal more often than not. Weaving in an environmental message that feels organic to the plot (and pays off nicely), he actually, in some ways, improves on Disney’s animated milestone! Mowgli, mostly just a naïve dope there, this time shows a brightness, physicality and resourcefulness that is a lot of fun and will likely prove more engaging for young viewers looking for a protagonist to relate to. 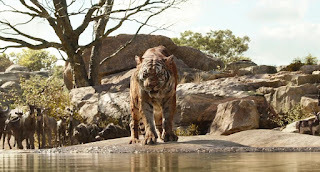 The script also adds much-appreciated detail to oft-underwritten parts like Mowgli’s adopted wolf mother Raksha (Lupita Nyong’o), and gives Shere Khan a motive that’s actually reasonably sympathetic even if he himself isn’t. 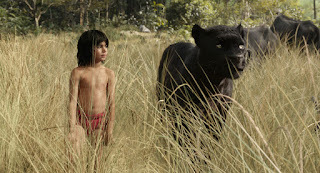 The boost in screentime for these figures does, unfortunately, result in a reduced role for Scarlett Johansson’s unsettling Kaa, which is too bad but hardly a cardinal sin, and perhaps takes a beat or two away from further heightening the emotional stakes of the friendship between Mowgli and Baloo. Generally speaking, it is often difficult not to roll one’s eyes at current day Hollywood’s chronic propensity for relying on A-list stunt-casting when it comes to animated characters. The Jungle Book is undisputedly guilty of this, however, to its credit, the majority of the actors work splendidly. Elba does a hard right turn away from George Sanders’ amusingly pompous 1967 Khan turn, offering up a baddie who exudes menace and looming violence. It’s doubtful we’ll ever see a Khan that out-terrifies this incarnation. A genius choice on paper, Murray is as good as you’d expect as Baloo, although it’s nearly impossible to improve upon Phil Harris’ legendarily acclaimed performance. Still, the actor brings the perfect amount of goofy, rough-around-the-edges charm to the celebrated bear, and plays nicely off the noble gravitas of Kingsley’s majestic kill-joy Bagheera. As King Louie, a potentially cringe-inducing Christopher Walken is anything but, unexpectedly instilling the towering ape ruler with an intimidating hardboiled New Yawk gangster attitude (trust me, it works). It’s honestly more than a little astounding how legitimately engaging and creatively inspired this movie is, especially following in the wake of the oddly hollow Alice in Wonderland, the crummy Maleficent and the lovely-yet-forgettable Cinderella. Favreau and his team have crafted a surefire entertainment for all ages that’s immersive, rousing and enthusiastically stimulates the imagination, as opposed to pounding it into submission with dull-witted noise and fury. 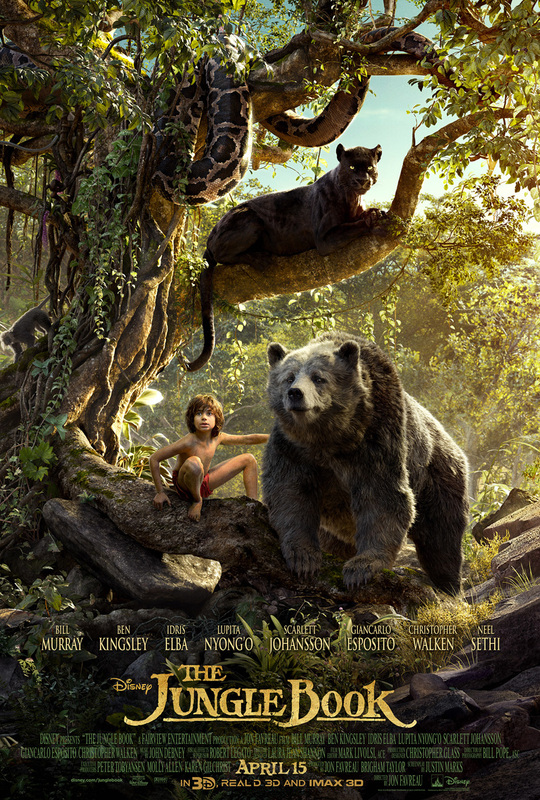 By mashing up the enduring whimsical spirit of Rudyard Kipling’s tales with next level craftsmanship, The Jungle Book takes you on a heck of a ride so long as you, to paraphrase Kaa, trussssst in it.